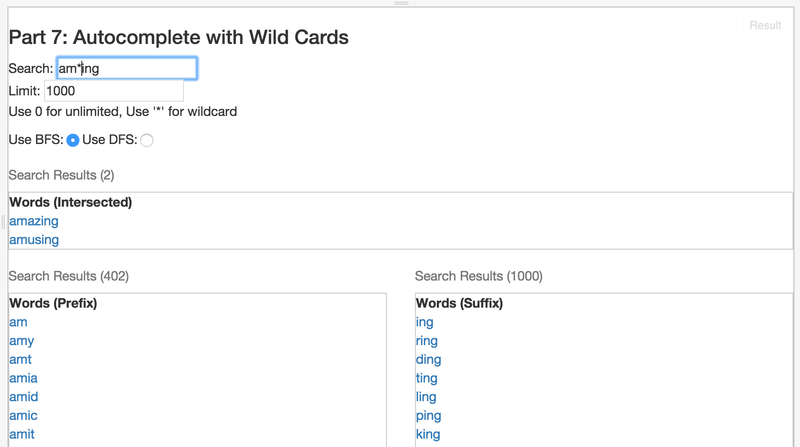 In the previous blog post, I discussed autocomplete with wild cards. That implementation was based on simple prefix tries, where each character in each word maintained a separate node. Insertion, removal, and traversal of the simplistic prefix trie is easy; We simply traversed along the path per character in the word being looked up. If we fell off the path, we knew that the word wasn’t in the dictionary; if we didn’t, we could determine whether the word was in the dictionary by checking the whether terminal = true, and further traverse to generate a set of all suffixes with that prefix. In this blog post, I take that implementation one step further and implement insert, remove and traverse for a compressed prefix trie. What are the advantages of a compressed prefix trie? Essentially, the implementation is superior in every way except complexity compared with a simple prefix trie. Faster construction of the trie. The same advantages above apply. What is a Compressed Trie? A compressed trie builds upon a normal trie by eliminating redundant edges in the trie. In my implementation, I compress down each branch (representing each suffix). I could go even one step farther and use pointers to existing substrings in the trie. Using this approach, I’ve heard of compressibility/memory savings using only 16% compared with a full-blown trie. Thus, right off the bat, you can see that the size has shrunk by 30 nodes, or ~ 75%. Of course, real memory savings is a little more vague, since each flattened node is now larger by holding a larger value. What changed from the uncompressed to the compressed trie? Essentially, you can see that each branch of the trie that only had one child could be compressed into the same node. For example, pineapple is the only word that starts with p in the dictionary, thus each edge could be compressed down to one word. This algorithm simply traverses up the chain, squashing any redundant edges along the way. Next, if we apply this across all leaf nodes, we can optimize the entire trie. With this information, we have everything we need to either remove the node, insert new nodes from this point, determine whether the word exists in the trie, or continue traversing to complete the suffix set. By following this approach, we’ve derived the compressed trie data structure. However, we arrived at an offline algorithm for actual construction; that is, we need the entire corpus of words in the dictionary to construct the trie. Then, once we have constructed the entire trie, we need to traverse the entire trie again and flatten every branch, essentially doubling the amount of effort for trie construction. On very large datasets, this can be costly. This is known as an offline algorithm, or one that requires the whole dataset in order to construct the output. Contrast this to an online algorithm, which can produce the desired output incrementally. The implementation of the online algorithm for compressed prefix trie construction is very tricky. There are lots of edge cases, maintaining state so we know how far into the trie we’ve gone, and taking slices of prefixes so we can continue splitting nodes and swapping children. I’ll just describe it here, but you can see the implementation for the gory details. Dictionary size: 86036. Running through creation 5 times. Dictionary size: 86036. Running through prefix traversal 1000 times. Dictionary size: 86036. Running through suffix traversal 10000 times. Dictionary size: 86036. Running through brute force traversal 1000 times. You can see that compressed trie construction is > 50% faster, prefix lookups are 33% faster, suffix lookups are ~40% faster. This is without spending much time optimizing either. Double this for maintaining the suffix trie as well for suffix matches. Thus, we can see that our trie is about 60% smaller than the uncompressed trie. Awesome. If you recall, prefix trie construction required linear time for construction, O(n) time where n is the number of words inserted into the trie. We read in each word from the dictionary, and inserted each character starting from the root. From the prefix trie, we were able to traverse the trie for any prefix, then with DFS or BFS collect all substrings stemming from the node to which we had traversed. In other words, we were able to quickly find all strings with a prefix of m.
What if we flipped our intuition around and wanted to find all words that contained a particular suffix? E.g. “ing”, “tion”, “lion”? We can use the same approach for building the prefix trie to build a suffix trie. “gfedcba”, we can construct the prefix trie out of the map of reversed words. So in this case, “g” becomes the root, followed by “f”, “e”, “d”, and so on. Construction of the suffix trie is trivial, once we have the code in place for constructing the prefix trie. From our dictionary, all that is needed is to generate a dictionary using each word in reverse, then pass it into our trie constructor. Note that a suffix trie is essentially a subset of a “suffix tree” which contains pointers to every suffix of every word inserted into the data structure. Compare this to the simpler approach I’ve taken here which just contains each word in the dictionary. Finally, by maintaining both a prefix trie and a suffix trie, we can implement basic intermediate wildcard functionality (up to 1 wildcard). All we need to do is find the set of prefix results and suffix results and intersect the arrays. 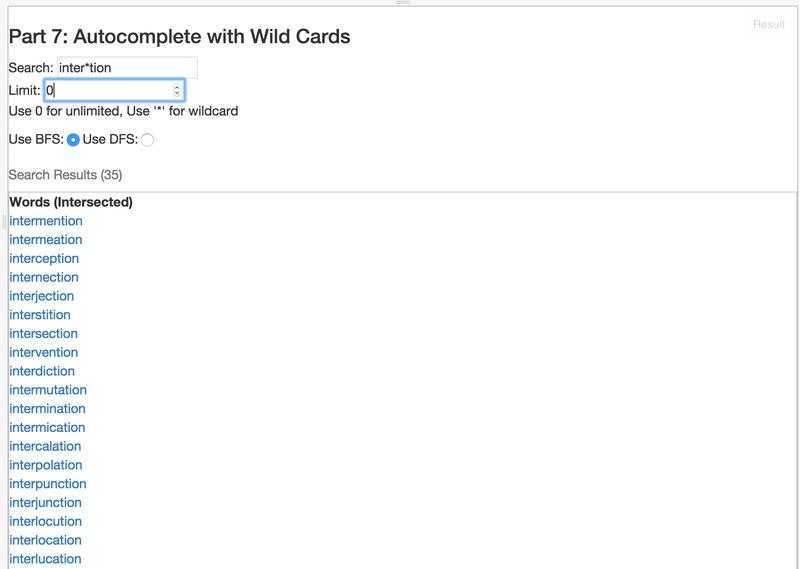 As an aside: why doesn’t this approach support multiple wildcards (e.g. int*me*tion, which would yield [“intermediation”, “intermention”, etc.])? The answer is the implementation of the suffix trie, which only contains the entire word (as opposed to all suffixes). If we tokenize int*me*tion into [“int”, “me”, “tion”], we see that me will not return any prefix/suffix results that we expect because with our given prefix and suffix trie, we can only identify words that either begin with “me” or end with “me”, not have “me” somewhere in the middle. To add this functionality, the implementation would need to be expanded to full blow suffix trees. (Alternatively, we could also use something more powerful like ternary search trees). 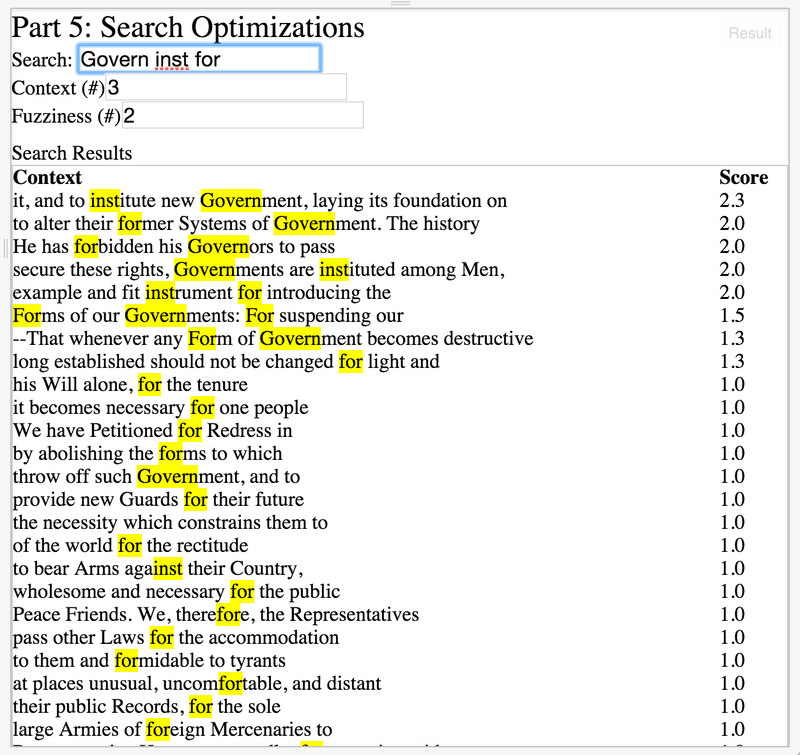 I’ve spent a lot of the last posts demonstrating how to perform full-text fuzzy searches, highlighting, and index generation, and talked about some of the pros and cons of ngram indexing. 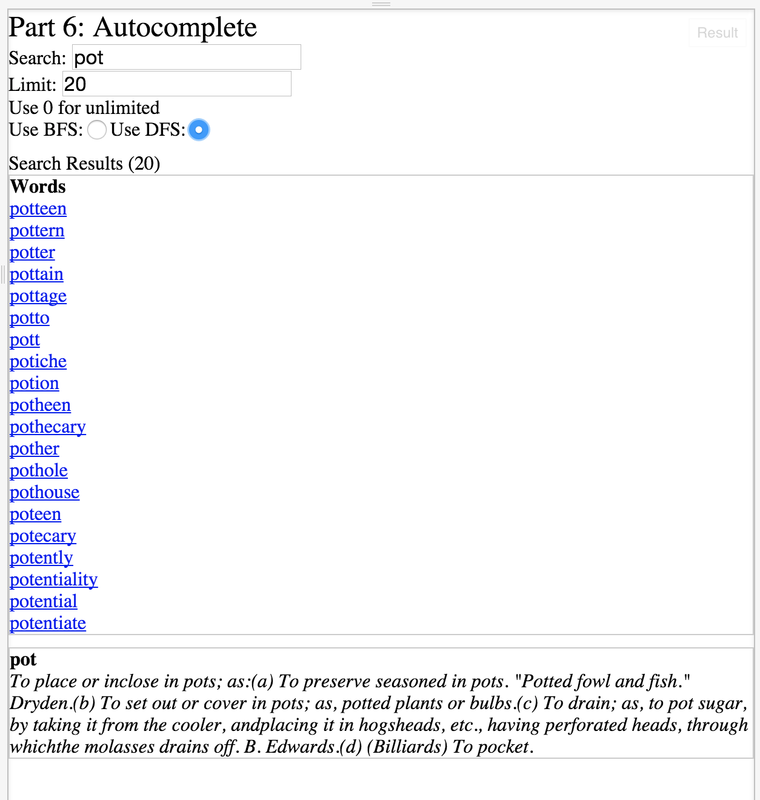 This post departs from search and focuses on solving a different problem: autocomplete. As I mentioned in the first post, there is no silver bullet to search relevance. At Twitter, this means trying to tackle relevance from many angles – index generation, manual ranking of documents, query classification, etc. Another means of getting better relevance is by trying to guide the user’s query to known queries with good sets of results. In this post, I’ll demonstrate how to generate build out an autocomplete functionality that can be used to get the user to the right query. This should be pretty obvious to most readers. You’ve most likely encountered autocomplete in many places. For example, when you type into Google’s search bar, you’ll get a list of suggested queries. When you begin typing an address to Google maps, you’re presented with a list of possible matches. The google-esque type of functionality probably requires a different solution altogether than the solution I’m proposing. This post, on the other hand, describes one possible implementation of a way to provide some (but not all) autocomplete functionality. A slightly non-obvious benefit to autocomplete is that adding autocomplete functionality not only serves as a convenience to the end user, but also is a forcing function that helps to drive search relevance. By guiding the user to a set of searches with a set of high quality search results, one can help guide the user to those results through query modification. In this trie, “code” is one potential path, and each path to the root, “cod”, “co” and “c” are all prefixes of “code”. However, not all of those prefixes are valid words, so the prefix trie must be able to distinguish between good and bad entries. In my sample application, I use this use this data structure to efficiently store an entire dictionary, with the guarantee that there is only one path per entry (autocomplete result). To get to the list of results that can match, I traverse the prefix trie as far as I can go with the user’s query, then use various traversal techniques to find all suffixes for a particular prefix. 1) Node – Each node in my implementation has one character as the value and a set of children. Prefix tries can be constructed with a variety of data structures to represent children for each node (e.g. arrays, linked lists, maps). In my implementation, I opt to use hash maps for space optimality and constant speed lookup. However, other popular implementations use arrays or sorted linked lists, which enables a fast sorting of a set of words through a preorder depth first search of the prefix trie (described below). 2) terminal: Boolean – For each word inserted, a path is created from the root node to the leaf node. Thus, it can be assumed that any path from the root node to a leaf node without children is a valid entry. However, there are valid entries that are prefixes of other entries, so there must be a way to distinguish between a valid and invalid path. Hence the terminal flag. 3) duplicates are not stored in the prefix trie (ergo, each path represents a unique result). We could easily store the number of occurrences of each prefix in the trie. 1) Prefix tries can be faster than hash maps for word look up – The longest path to look up a word in the trie takes O(m) time, where m is the length of the word. For a hash map, with a bad hashing function, you could take in the worst case scenario O(n) time, where n is the number of entries in the hash map. 2) Suffix detection – any path to a parent node represents a prefix of all paths through the parent node. Thus, it’s possible (and necessary) to construct an array of all suffixes stemming from the prefix and autocompleting a given result. 3) Sorting – as described above, prefix tries can be used to sort a set of words so long as the children keys are sorted. In this implementation I use hash maps, so the keys are not sorted by default (but we could opt for a different data structure). Once the prefix trie is constructed, one only needs to traverse via DFS. 4) Prefix tries can be space efficient – Since only all unique prefixes need to be stored in the trie, we don’t need to store needless duplicate keys. As with typical trees, one can opt for different methods of traversal to construct substrings from a parent node. I’ve provided a few different implementations below. BFS (breadth first search) – With breadth-first search, as we traverse to each child node, we invoke the traverse function call for each child nodes’ children. This is equivalent to traversing by visiting all nodes at each depth before traversing each next level node. This returns matching autocomplete results in order of length. One gotcha here: since BFS uses a queue to control the order of the nodes to visit, we need a way to maintain the prefix up to each node. While each node contains a pointer to the parent, so we could conceivably traverse up to the root node, this would require up to M moves (where m is the length of the word) repeated N times (for each result), resulting in O(MN) time to construct the autocomplete list. Alternatively, I keep track by simply enqueueing a tuple of the [Node, prefix: String] each time, such that we can construct the autocomplete list by traversing to each node once in O(N) time. DFS (depth first search) – With depth-first search, we traverse to the deepest node before starting to recurse. As described above, this method is useful for radix sort if the keys are kept in sorted order (they aren’t in my example). As with normal DFS, we can traverse the tree preorder, inorder or postorder. You can see from my example that I traverse as far left as possible until the left node is a leaf node, then I visit that node, then visit each sibling node called with the prefix up to that point. Without any intelligence (algorithmic or otherwise), autocomplete only has limited utility in cases where the result set is large. You can see in this instance, where there are about 109k words in the dictionary, that limiting the user to 10 results probably wouldn’t get the user to the desired query. This current implementation doesn’t account for mispellings in the word or any leniency (e.g. leaving characters out, adding extra characters). However, we can combine elements of the ngram text search discussed in the first 5 parts of this series. Essentially, the first ngram of a word is also a prefix of the word, so we can use the prefix trie to do some quick filtering, then return a set of fuzzy matches. In the last part of the series, I introduced the concept of adding context around search results using pointers to the reference in the original document. While this works well for exact pattern matching, it fails for scenarios where the user may have mistyped, misspelled or doesn’t type out the entire query. In this entry, I’ll explain how to add some basic fuzzy matching to your full text search. Essentially what we’ve implemented in parts I – III of the search engine series is a less powerful version of grep. Cool in some ways, but we’re trying to achieve a different goal here. Note that grep allows regular expression matching which we could implement as well. The way this would work is rather than breaking apart the user’s query into ngrams then keying off our hash to merge the matches, we could iterate through the trigrams we found to see which matched the user’s regular expression, then merge the matches. 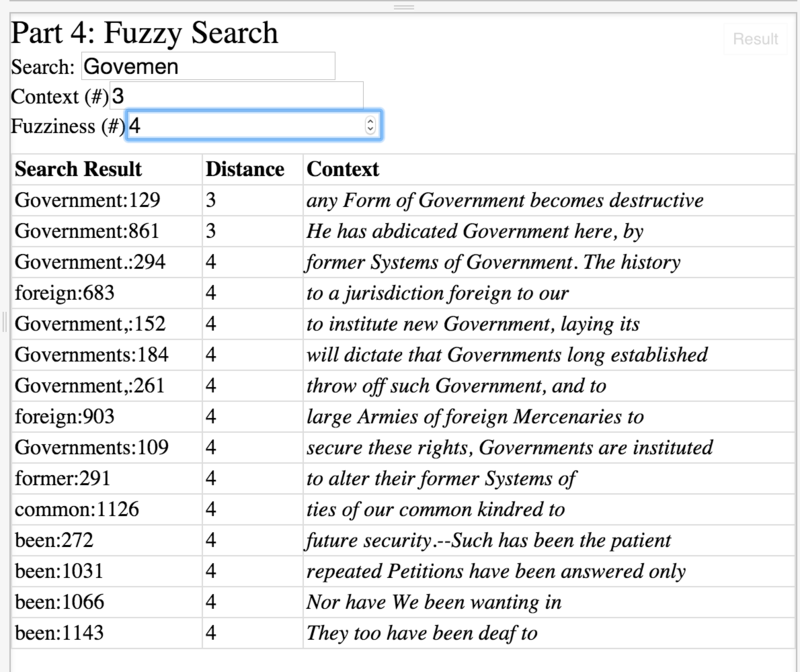 Instead, we are implementing a basic version of search through documents, so we want to have some fuzziness feature. Fuzziness naturally introduces imprecision into textual search. If we consider fuzziness a dial which we can turn up or down, In order to implement it, we also need to have a weighting function that will compare similarities between strings to determine whether we are under our fuzziness threshold. * Recursively computing levenshtein distance on substrings of decreasing size. * distance is 1. Note the prime opportunity optimizing w/dynamic programming. This is all well and good, but how do we use Levenshtein distance for matching? Here’s where the science gets a little imprecise (at least in my mind). There are really two places where we can use Levenshtein distance to compare the search query with our result set. 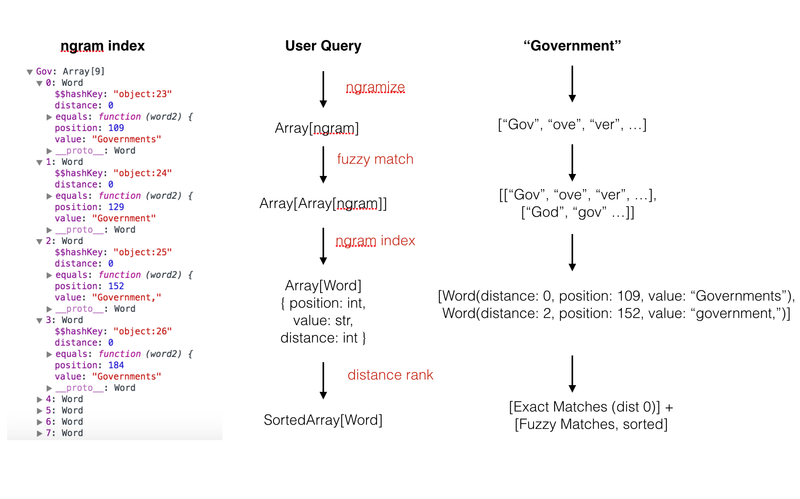 1 – as we break apart the user’s query into ngrams, we can find other ngrams with a distance < fuzziness, and 2 – when we return a set of results that may be close but no cigar, we determine whether the matching word and the query have a distance < fuzziness. In my implementation, I do both. We have to be careful with 1, because depending on the size of our ngram (trigrams in our case), if the fuzziness is set too high, we may just end overinclusive of the fuzzy ngram matches against which to find our result set. Proof: Any ngram has a max Levenshtein distance with another ngram of equal size of n. So in my naive implementation, I only select ngrams where the distance <= 1 (note that since our trigrams form a set, the distance will never == 0). It behooves us to precompute the hash of trigrams to their fuzzy matches, because the alternative would be iterating through all keys in the trigram hash -something very expensive to do in real time. Then, when merging the results, we need to determine how to sort our results. It turns out we can also use Levenshtein distance here to rearrange the results in an order that makes sense, but this ranking can be whatever you want. My implementation simply stores and sorts by Levenshtein distance to the user’s query. If the distance is greater than some fuzziness factor, we can just throw out the result. Note: In order to speed up the sorting, since we know exact matches are going to be the most precise (yet may have a large distance because the matches are substrings), we always push those to the front of the results and sort the remainder of the results returned from the fuzzy search. Additionally, because fuzzy matches may overlap with exact pattern matches, we have to transform the search results into a set (i.e. call unique() on the result set). In my implementation, I added a few details for precomputation/speed. In order to figure out what fuzzy trigram matches there are, after I build the initial trigram index, I iterate through the trigrams creating a second map keyed on the trigram to its fuzzy matches. After splitting the user’s query into trigrams, I get the set of trigrams pertaining to a fuzzy match, then filter out the non-fuzzy trigrams. I use a faster implementation of Levenshtein distance that takes advantage of dynamic programming. When reordering the results, I map a new distance from each potential fuzzy match to the original search query. I only do this for fuzzy matches, to reduce computation time. Disclaimer: As usual, things could be sped up and optimized, but I tried to keep things simple (e.g., using a simple distance calculation and simple ranking algorithm) for readability. Fuzzy matching sample. Try playing around with the fuzziness tolerance. Also: I’m getting fancy with CSS. Watch out! There is a large variety of distance formulae out there. You might get better results with one or another. Trigrams are pretty standard for full text search, but if fuzziness is a real concern, then it might be worth trying with quadgrams and a distance of two, however, I suspect that there would just be too many quadgrams and the search would slow down. 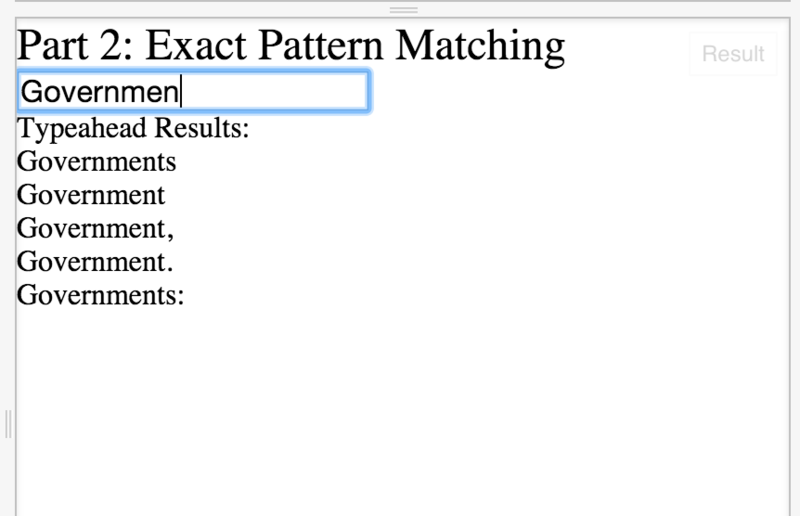 In part II of this search series, I covered exact pattern matching. Through a clever use of array intersection, we were able to eliminate false positives/irrelevant results when matching a user’s query. However, that ability in itself is not very useful if context cannot be provided around the search. In part I, I covered generating your ngram index. In this post, I discuss how to provide context (i.e. words before and after) with each “hit”. Again, as with adding exact pattern matching, adding context to your search isn’t difficult. Before, our ngram data structure keyed a trigram to a set of words matching the ngram. However, we lost the place within the original document where the word could be found. If we follow that approach, for every hit returned from our search, we would have to traverse the entire document for matches, then return those results. Not good. Then we need to modify the method ngramize to adhere to our new data structure. Instead of pushing onto our array references to the word, we need to instantiate a new Word() object for each ngram match. Note that this method has nearly remained the same as in the previous implementation. Finally, we now need to rewrite merge to intersect all arrays of matches based on equality of Word. To do this, I wrote a simple method called equals that lets one Word be compared to another. A Word is equivalent to another Word if the value and position are identical (i.e. they are the same reference within the document). Finally, our merge method is rewritten to take advantage of this intersect method. See how the merge method has been simplified? Awesome! The end result is instead of getting an array of strings (i.e. 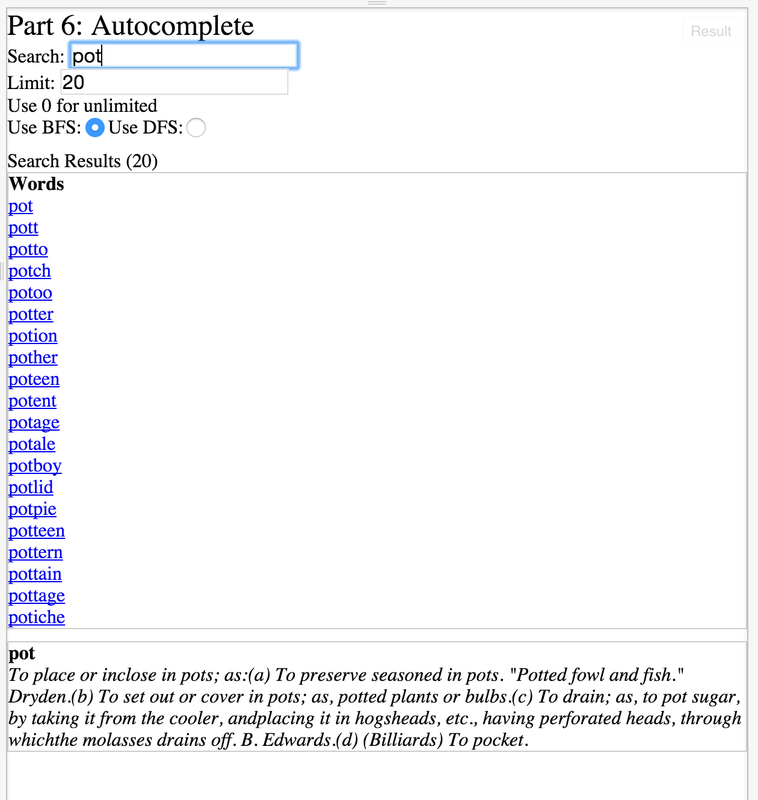 word matches) based on the user’s query, we now get an array of Words. Since each Word has a pointer to the word in question in the original document, all we need to do is take a slice of the original document based on how much context the user wants and join them together again (using a space). Disclaimer: Again, this is just a toy implementation! To productionize properly, you may want to implement a few of the other features mentioned below. If you’re still with me, you’ll find lot of opportunities for optimization. I haven’t added them in my toy implementation, but they wouldn’t be hard to do. As the original document increases in size, it becomes more and more necessary to implement some of these enhancements, but I’ve kept things simple for readability. Space efficiency. Notice how we’re storing the value of the word (i.e. the string) in each Word. That’s really wasteful! Words can be long (e.g. : “supercalifragilisticexpialidocious”), so we can much more efficiently store pointers to words, as we store pointers to the position within the original document. Smarter precomputation of ngram index. We can sort the arrays for faster intersection! Though our insertion time into the array in the initial computation of the ngram hash is O(1) right now (we just push it to the end of the array), we can reduce the speed of initial computation for faster recombination later on. Read: Keeping sorted ngram arrays requires binary insertion of each new Word, something done in O(log n) time. Faster array intersection. Example: If we store pointers to words instead of the actual word itself, this method lends itself to intersection of all arrays in O(n) time, instead of O(n^2) time. This lends itself to an awesome speed up! Note: I’ll implement these things at some point in the future, so you have something to look at. And of course, on top of all these things, we could add your run of the mill features like caching, keeping your index in memory, distributing your indices, etc. We can also add contextual highlighting, within our results. This is definitely a big visual help that lets a user know where within the search result the query is found.